Wi-Fi SD cards have been around for quite a long time, but they didn't really work that well. After digging around, I decided to try out Toshiba's 32 GB FlashAir Wi-Fi card, and to my surprise, it works well, as long as you keep your expectations in check. I've been hesitant about Wi-Fi SD cards because they sound like witchcraft. I tried one of the original Eyefi cards back around 2008 and hated the entire experience. I hadn't looked back until I recently, when I decided adding Wi-Fi to my camera would make transferring photos to my phone a little easier. After all, these things had to work better by now, right? The FlashAir is the cheapest name brand option right now, with the 32GB card regularly going for around $60-70 compared to the Eyefi's $127 and Transcend's $160. So, after testing out the latest Eyefi for comparison's sake and deciding the extra features weren't enough for me, I went with the FlashAir. Using the FlashAir is pretty simple once you understand exactly what it does. In the case of the Toshiba FlashAir, you plug the card into an SD slot, and the card then broadcasts a Wi-Fi signal that you can connect to from an app on your phone or computer. You can even connect directly to the card using a special URL (because it's also a tiny server). Essentially, the FlashAir is just a hot spot that sits inside your camera but happens to also be an SD card. Turn on your camera with the Toshiba FlashAir inside of it. The card automatically starts broadcasting a Wi-Fi signal. 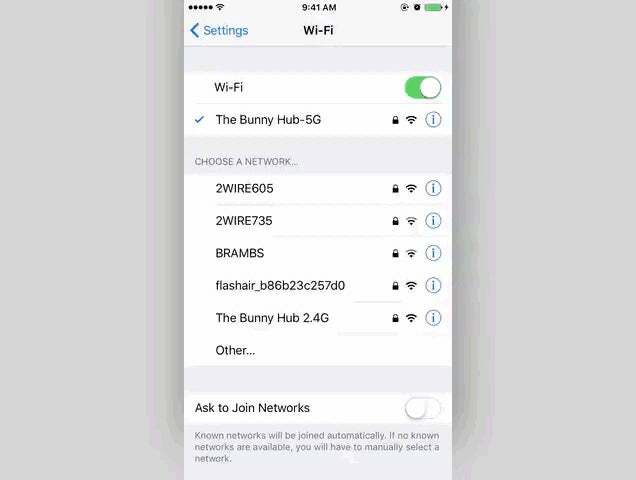 Go to your phone or computer's Wi-Fi settings and connect to the Wi-Fi network from your card (for the FlashAir, the default is flashair_randomalphanumericstring). Open up the Android, iOS or desktop app, and download your pictures. By default, the Wi-Fi signal broadcasts for five minutes, but your camera's battery powers the Wi-Fi, so when your camera shuts down, it will take the card (and the Wi-Fi) with it. This also means the SD card eats a bit of your battery power, though I didn't notice that big of a difference in battery life. It's worth pointing out that the Toshiba FlashAir III works a little differently than the far more popular (and much pricier) Eyefi Mobi Pro line of cards. 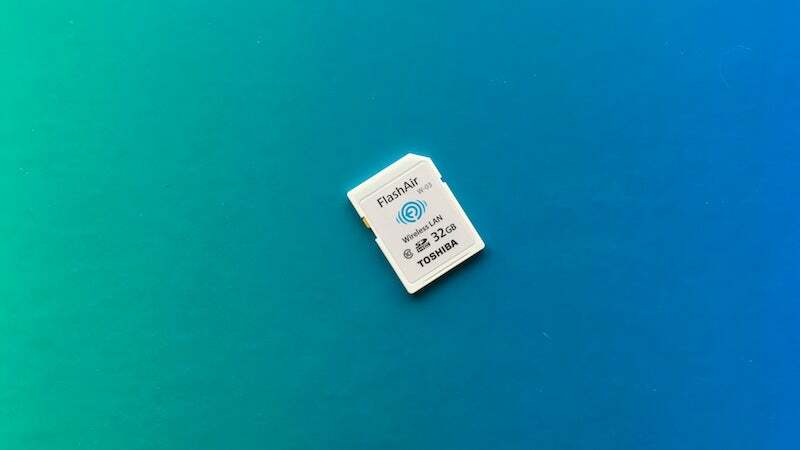 The Eyefi card can either create a direct connection by making its own Wi-Fi network like the FlashAir, or it can connect to your home Wi-Fi network to automatically upload photos to a cloud service or other device. Depending on what you what from your device, this is an important distinction to make. The FlashAir cannot connect to your home Wi-Fi network, so the process of getting photos to another device is never automatic. I found the FlashAir best suited for one thing: getting photos from my camera to my phone. To this end, it does the job wonderfully. It's also a perfectly acceptable SD card, with class 10 read/write speeds that allow for snapping RAW images and recording HD video without hiccups. And honestly, that's all I want. I barely trusted this technology to begin with, so the fact that it actually works as advertised and lets me pull photos off my camera and onto my phone over Wi-Fi is enough to impress me here. There's a part of me that wishes the FlashAir would connect to my home network and automatically upload images to my computer when I walked in the door, but I'd probably never trust that feature and I'd do it manually anyway. The FlashAir app for importing photos is also nice and simple. You can import photos, change some settings (like the SSID and password) on the card itself, and that's pretty much it. This is probably a drawback for some people, but honestly, there are millions of excellent photo editing and management apps on iOS and Android, and I guarantee whatever Toshiba tried to make would pale in comparison to third-party offerings. It's also nice that you don't have to register with another service to use the apps (like you do with the Eyefi). Plus, if you hate apps (or don't have an Android or iOS device), the FlashAir is also functions as a little server that displays your photos at flashair.com so you can access them from any browser. 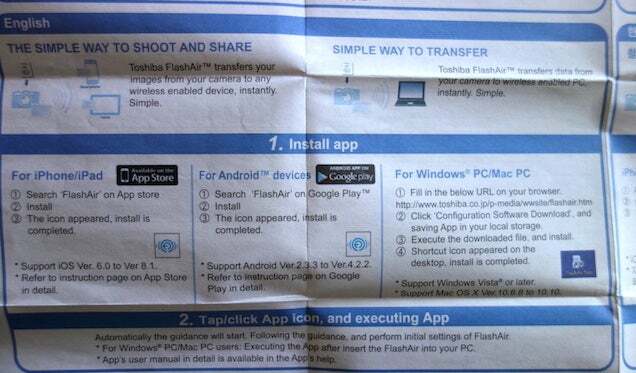 As you can see from the image above, the documentation that comes with the FlashAir is laughably oversimplified and borderline insane. That image is the entire manual, that's it. So, you'll need to figure out how to use the FlashAir on your own without a lot of help. The manual doesn't tell you how to connect your phone to the SD card, it doesn't tell you the default password for the hotspot it creates (hint, it's 12345678), and it doesn't even bother to explain how the thing actually works. Sure, it's pretty easy if you're tech-minded, but if you're not, Toshiba's manual is a befuddling masterwork of nonsense. It's also worth remembering the range of the Wi-Fi signal is about as far as you'd expect from this hacked together ramshackle technology. I couldn't get it to work reliably beyond a few feet, and the transfer speed is around 2MB/s, so don't expect crazy fast transfers. The range is so bad that it's pretty useless if you want to transfer photos to your PC because by the time you get within range you might as well just pull the card out of the camera and plug it into your computer. The Eyefi card has much better range, so if that's what you're looking for, that card is more up your alley. There's also an internet passthrough mode that allows you to access both the Wi-Fi card and another Wi-Fi network at the same time, though it was unreliable for me. I also couldn't for the life of me figure out why on earth I'd need to ever use the feature to begin with. If that's a feature you need, you'll probably want to look elsewhere. While I personally didn't struggle with how the whole hotspot photo transfer system worked, Wired described this process as a "cumbersome deal-breaker". It takes about 10 seconds worth of your time, which is a far cry from cumbersome if you ask me. If that sounds like too much effort, then stay away from the FlashAir. I bought the FlashAir III because I didn't feel like shelling out the extra cash on a new camera when all I really wanted was Wi-Fi. To that end, it's terrific for me. I've always been hesitant about Wi-FI SD cards because the reviews have been all over the place, but I think a lot of that has to do with expectation more than anything else (though the shoddy documentation certainly explains a lot of people's struggles too). If you're worried about the card not working, Toshiba does have a list of compatible cameras, though it covers pretty much every camera from the last decade. For what it's worth, I tested it in a Sony RX100 and a Fuji X100. I've already said this, but just so we're all clear here: I think the FlashAir is a fantastic card if all you want is a simple way to transfer photos from your camera to your phone when you're on the go. I've been using this as an easy way to pull stuff off my SD card and upload it to my cloud storage or social networks when I'm nowhere near home and it does a great job at that. If you're looking for something that will automatically upload your photos to your computer when you walk in the door, look elsewhere. I've been using this in my 450d for a little while now, and 100% agree with you. Fast enough for storing RAW pics, with a laughably short wifi range. But as a quick way of sharing photos, it's perfect for that job.